The Adams Lady Speedline F10 Driver is specifically shaped to reduce drag. The crown of the driver has been reshaped so that the peak height is much higher than topline, and the frontal cross-sectional area is reduced with heel and toe cutouts. Adams says this driver has "2.5 to 4.2 mph higher clubhead speed and 3 to 9 yards more distance through more efficient airflow around the clubhead." The coolest thing is it accomplishes this without changing to one of those freakish geometric shapes. The traditional-looking clubface is very large with a 460cc clubhead that is very forgiving with a huge MOI. 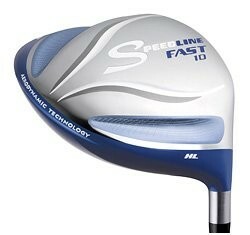 I like this driver and would compare it to the TaylorMade Lady Burner SurperFast Driver. However, the TaylorMade has the aforementioned freakish triangular shape that looks like a fighter jet wing. I also recommend the TaylorMade Lady R9 Supertri Driver. It has an adjustable driver head, giving you up to 75 yards of right left variance.